Certainly it is gonna be another knowledge and things to explore on when it comes to Outdoor Roller Blinds. Unlike the indoor roller blind that you see commonly in offices, people’s homes but also it is very useful and ideal to fabricate an outdoor roller blinds capturing the same theme as your indoor roller blinds despite the mechanism system difference. you need to know the main importance of outdoor roller blinds. Installing at the yard and balconies area aids blockage of harmful rays and sunshine that is disturbing and causing damage to your eyesight and protect your interior timber wood floor works from destruction by long term sun-glare. The outdoor roller blinds also helps to withstand and prevent bad weather conditions of strong wind and heavy, pouring rain. Furthermore, the roller blinds can provide you the needs of privacy from your opposites neighbor so you can have personal space at your own balcony or yard area! So what does the outdoor roller mechanisms system works? The main difference of Outdoor Roller Blinds compare to indoor roller blinds is the mechanism. Outdoor Roller Blinds uses strong and thicker tube measuring 50mm and above. It is build in such a way to withstand the strong wind as well as to prevent bending of the tube. Side guides is an important reinforcement installed to improvised for safety purposes which is fairly important. Accordingly to it’s name, it is a pair of stainless steel wire being install on each sides of the outdoor roller blinds to hold and support the blinds from swinging, “flying” high on windy days. Imagine the blinds being flew high and hitting it down right at your glass panel causing damage cost for your home. How about fabrics and materials differences? 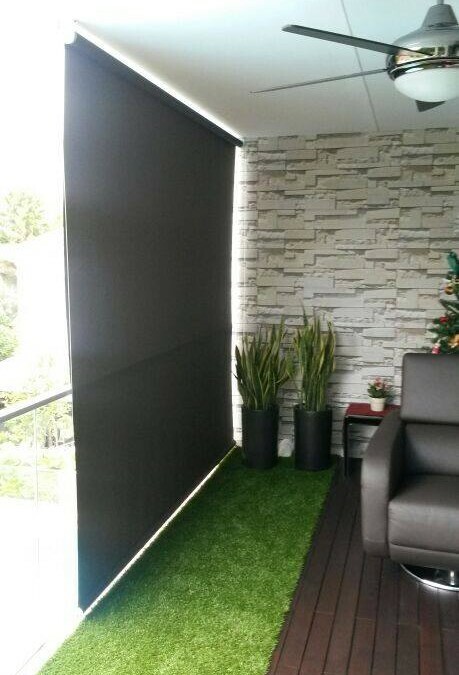 Outdoor roller blinds uses perforated fabrics which are the combined materials of PVC and polyester. This material lessen the flapping movements while allowing some wind to pass thru. At Singapore MTM Curtains, we provide also a customized durable material famous for it’s longevity. It is make up of a woven base cloth of high tenacity polyester yarns. This customization enhance the tear strength, tensile strength and dimensional stability on the finished product. This durable series material had exterior coatings on the surface which generates the maximum protection against atmospheric chemical, microbial and fungal attacks. Weather resistance to ultra violet radiation, rain and abrasion. Furthermore there is a international ISO standards on colour fastness test which met the score a 8 points while the common indoor material is only at 6 points. Always reject those agents or suppliers that offers an cheaper alternatives that sound unsafe and inconsiderate. Cheapest source might not be in quality, much less to say in GOOD quality still. Comes with installation and safety improvisation – it is only slightly more expensive than the normal rollers blinds. Always engage a Singapore licensed contractor or Supplier to fabricate and customized your blinds for you. Probably they are the only professional who can guide you through the best decision and offer their best products. Let’s just be open and truthful with designing your home. We know what you need – Singapore MTM Curtains.